This extremely brief and necessarily selective account of the town of North Shields is intended only to provide a broad geographical and historical context for the contents of this website. Readers are recommended to visit the Wikipedia page about North Shields for more detailed historical, geographical, civic and economic information. NORTH SHIELDS is situated on the north bank at the mouth of the River Tyne. 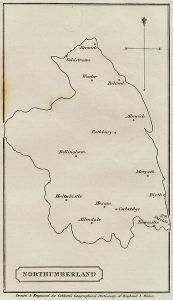 Although now part of the modern adminstrative county of Tyne & Wear, until the boundary changes of 1974 it was part of the ancient county of Northumberland, the northernmost county in England. People born in North Shields prior to 1974 are likely still to consider themselves to be Northumbrians. 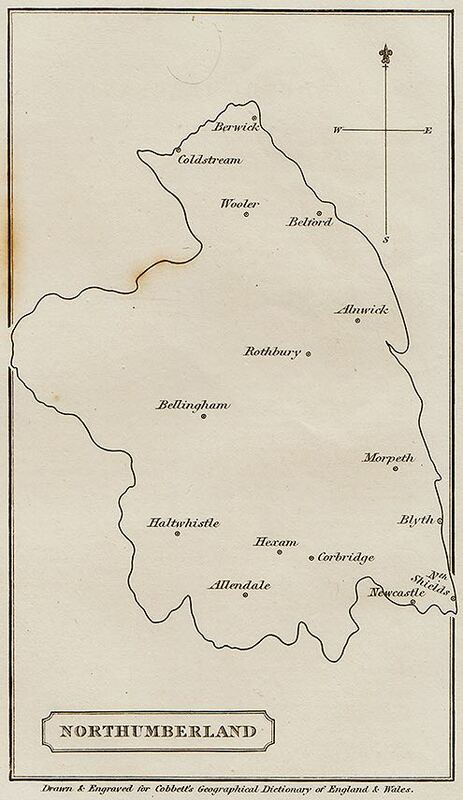 This map, included by William Cobbett in his 1832 Dictionary of England and Wales, shows the location of North Shields at the very south-eastern tip of Northumberland. 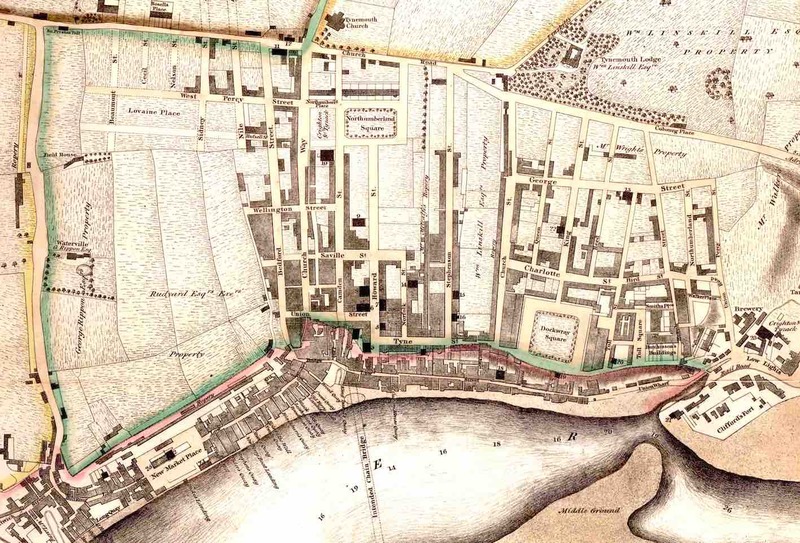 In the middle of the 18thC North Shields was a narrow settlement at the foot of the riverbanks, a more-or-less linear settlement known as ‘The Low Road’, the street running between the quays, warehouses and docks which lined the riverfront and the buildings and dwellings standing against the steep riverbanks. 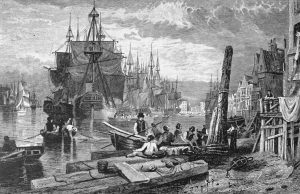 By the 1760s people who could afford to do so were beginning to move away from the crowded and insanitary dwellings of the old town, with its many quays and industries, to new developments of housing and commercial premises on the top of the riverbanks. The following extract from John Wood’s Plan, surveyed in 1826, illustrates the contrast between the old, linear town on the riverside and the new, more orderly development that took place between c.1760 and the date of the survey. The road along the top of the riverbanks in the new development lies perhaps 50-60 metres north of the riverside Low Road, but approximately 25 metres above it. 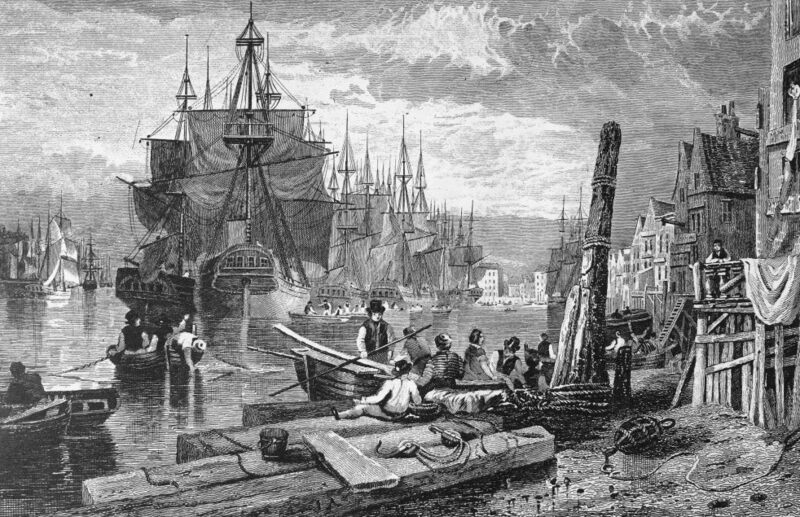 For centuries North Shields, along with the other towns along the Tyne, had been economically and commercially subordinated to the unjustifiable monopoly of all trade which was enjoyed by the city of Newcastle. During the late 18th and early 19thC this monopoly became increasingly unsustainable (in practice if not in statute) while an expanding North Shields developed to become one of the Parliamentary Boroughs created by the Reform Act of 1832. In 1848, Shields became a port in its own right, independent of Newcastle; in 1849 it was granted status as a Municipal Borough, and in 1904 became a County Borough. The process of civic consolidation initially included the neighbouring townships of Tynemouth, Chirton and Preston, and later embraced the settlements of Cullercoats, Whitley, Monkseaton and Murton. This succession of civic establishments reflects both the growth of the economy and the expansion of the built-up area of the town. Although the 1849 establishment was called the Municipal Borough of Tynemouth (the name of the parish in which North Shields had always existed), the economic generators in the borough were the original riverside settlement of North Shields, with its docks and industries, and the huge coal shipping trade immediately west of North Shields, exporting millions of tons of high quality coal from the very productive deep mines in SE Northumberland. During this period of civic consolidation, despite dynamic economic growth, the ‘low town’ of North Shields remained an area of dire environmental and social conditions. Quite apart from the cramped, decrepit and overcrowded accommodation, the water supply and sewerage provision were desperately inadequate, leading to repeated cholera outbreaks. An annotation in the parish register of Christ Church shows that Isabella Reid, wife to Robert (III) and mother to James, died of cholera in the major outbreak of 1849. It is possible that that pencilled annotation, one of many in the register, was made during the collection and collation of evidence either for the report submitted to the General Board of Public Health in 1851, or for the Cholera Enquiry Commission of 1854. 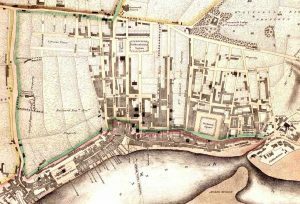 Despite the physical and social conditions, the riverside part of North Shields was a bustling place It was home to families such as the Reids and the Lamshaws, and the family of Andrew Wight, the printer who wrote “The Life of James Allan”. It was also, though, the temporary or seasonal abode of a huge, more or less transient population that included James Allan himself and a constantly changing mass of mariners and migrant workers. This population was supported by a myriad of traders, retailers, inn-keepers, and providers of all sorts of services. Some of those services were less than salubrious; a report presented at the Town Mission in 1903 and duly reported in the Shields Daily News stated that “the work of a missionary in North Shields is no ordinary task” and that in the slums of the town “vice, depravity, sin, immorality and lust were rampant”. There exist, however, several references to a vernacular musical culture in early North Shields, the earliest (so far discovered) being the record in the parish register of the baptism on 20th November 1636 of “Edward, Son to Richard the fidler of Sheles”. This was the backdrop against which the Reids, James Fenwick, and others acted out their lives and played their music.